Equal Exchange Banana Month: Part II | Small Farmers. Big Change. « March is Equal Exchange Banana Month! It’s mid-March which means Equal Exchange Banana Month is in full swing! This March also marks our 10th year in the banana trade. To celebrate, we are promoting a new web documentary called Beyond the Seal. This is the second of a three-part series that digs deep into Beyond the Seal (missed Part 1? Click here). 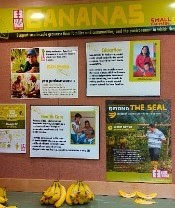 A recap: Beyond the Seal is the story of a group of small farmers – and the activists and visionaries behind them – striving to change the banana industry as we know it. Through a model of business called Fair Trade, these producers are building a more just supply chain, one that prioritizes their health, their families and their community. Beyond the Seal is a web documentary divided into 5 chapters. 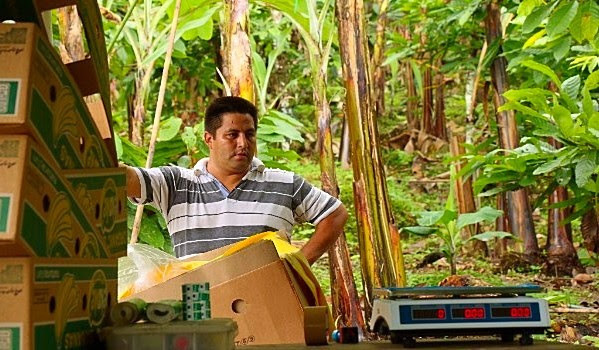 In Chapter 2, meet Anibal Cabrera, a small-scale banana producer and member of the AsoGuabo Cooperative in Ecuador. Take a peek into Anibal’s life and learn how the Fair Trade model strengthens and empowers AsoGuabo. How does the Fair Trade model support small producers? Under Fair Trade, producers receive a dollar per 40 lb. box of bananas as social premium. Do you see any difference between the premium and development aid or charity? 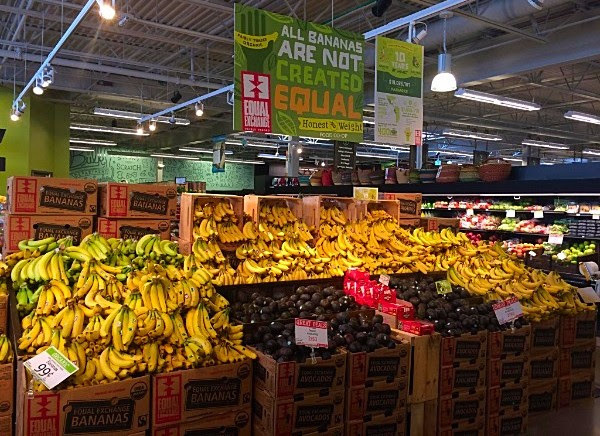 Shout out to Honest Weight for celebratingBanana Month with this incredible display! That’s 32 cases of bananas. Check out this eye-catching display atLebanon Co-op in NH!